Place a heavy, iron Dutch oven, (or iron skillet with deep sides) over medium heat and heat the oil until just smoking. Whisk in flour, a little at a time and cook, whisking constantly, until roux becomes smooth and thick. Continue to cook, constantly stirring with a wooden spoon and reaching all over bottom of pan, until roux darkens to desired color. Be careful not to produce specs of black. The roux must remain an even color throughout process. If specs appear you must start over. For a Light Brown Roux, cook the mixture, over medium heat for 1 1/2 hours, or until the color of peanut butter. Remove about 1 cup of the light colored roux, cool completely, and set aside for the Delmonico's Seafood Okra Gumbo. For a Medium Brown Roux, cook the mixture, over medium heat for an additional 30 minutes, or until the color of a copper penny when ready. 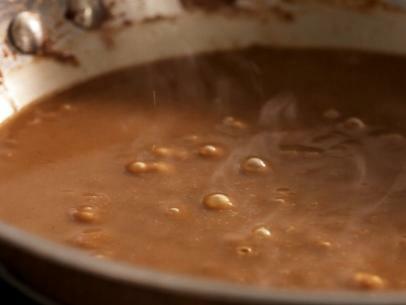 Remove about 13/4 cups of the medium colored roux, cool completely, and set aside for Emeril's Country File Gumbo. For a Dark Brown Roux, cook the mixture an additional 35 to 45 minutes. The color should resemble dark chocolate when ready. Remove all of the remaining dark roux from the pan and cool completely. Set aside for the Chicken and Sausage Gumbo. The timings for various shades of roux will vary depending on the cooktop as well as the amount of roux made. (A smaller amount will cook in much less time.) If this is your first time making a roux, the slower you cook it, the less likely you will be to burn it. The important thing is to cook the roux to the desired color, as specified above.